A burger for the record books! Line a plate with paper towels and set aside. Line a baking sheet with parchment paper and set aside. Grease the underside of a separate baking sheet with olive oil. Grease a third baking sheet with olive oil cooking spray and set aside. On the greased baking sheet, spread pastrami slices out in an even layer. Place the baking sheet that is greased on the underside, on top of the pastrami and place in a cold oven. Adjust temperature to 350ºF and cook pastrami until crispy, about 35 minutes. Remove from heat and transfer to prepared plate to drain and set aside. Meanwhile, on the lined baking sheet, spread cheese slices out in an even layer and place in oven once it has reached 350ºF. Bake until the cheese is crispy, about 10 minutes. While the cheese and pastrami are baking, preheat a grill or grill pan to medium-high heat. On a clean workspace, divide beef into 4 equal portions. Using hands, gently form each portion into a patty. Season with salt and pepper. Place patties on the grill and cook, flipping halfway through until medium rare, about 4 minutes per side. Remove to a plate and set aside. While the patties are cooking, place a cast iron pan on the the grill and warm olive oil. Add sauerkraut and cook, tossing occasionally until charred, about 5 minutes. Season with salt and pepper if necessary, remove from heat, and set aside. To Assemble: On the top and bottom bun, spread a small dollop of Thousand Island Dressing. 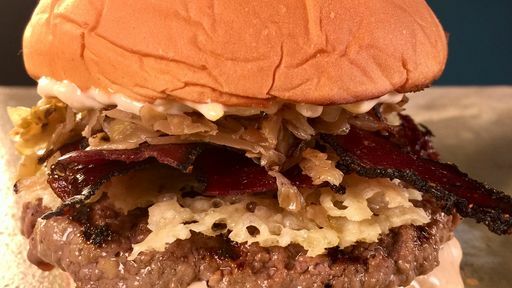 To the bottom bun, add cooked patty and top with a layer of cheese, crispy pastrami and sauerkraut. Finish with top bun and serve. For the Thousand Island Dressing: In a small bowl, add mayonnaise, ketchup, white vinegar, relish, onion, garlic and season with salt and pepper. Whisk to combine. To Toast Buns: In a dry skillet, over medium heat, add buns cut-side down and toast until golden brown, about 5 minutes. Remove from heat and serve. Tip: Crunched for time? Crisp up the pastrami in a saute pan with a little bit of olive oil!